Infants diagnosed with CLD (chronic lung disease) are more likely to suffer respiratory failure and subsequent death. Researchers from the Stollery Children's Hospital recently published a study in the Cochrane Database of Systematic Reviews on the potential effect of using the drug Hydralazine to prevent such deaths. Trials were researched for the study after reviews of PubMed and Embase, in addition to similar databases. After researching multiple databases, researchers were unable to find adequate studies on the effect of using Hydralazine on preterm infants. 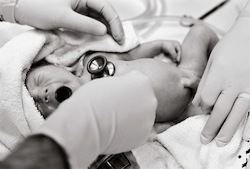 Hydralazine is an inexpensive medication that may have a positive effect on infants with CLD. Research is needed to determine whether or not the drug is safe and effective in preterm infant populations. It was noted that research is particularly important for areas where current medical treatments like sildenafil and nitric oxide are not available. Source: Kawaguchi A, Isayama T, Mori R, Minami H, Yang Y, Tamura M. Hydralazine in infants with persistent hypoxemic respiratory failure. Cochrane Database Syst Rev. 2013 Feb 28;2:CD009449. DOI: 10.1002/14651858.CD009449.pub2.